Okay, here we go with Week 2 of our tailgate pie baking adventure. 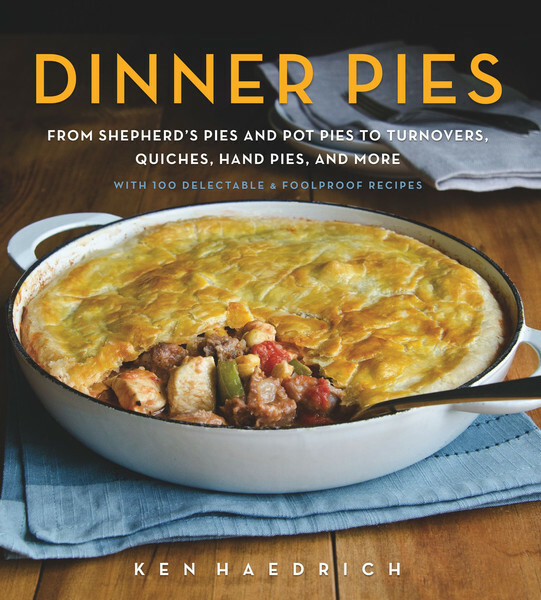 And just as a reminder, each week you’ll be alerted to the new recipe of the week on Thursday, leaving you plenty of time to roll up your sleeves, turn on the oven and produce a killer pie for the weekend festivities – wherever and however you do your thing. I was talking to a colleague in New Hampshire this morning, who told me that he’d been surprised at the quantity and variety of local apples coming to market already. This prompted a discussion with a local orchardist, who told him that the strange summer weather had played a roll in the early harvest. Long story short, it got me to thinking that I’d better start getting serious about fall fruits in my pie offerings, and thus this autumn standout. 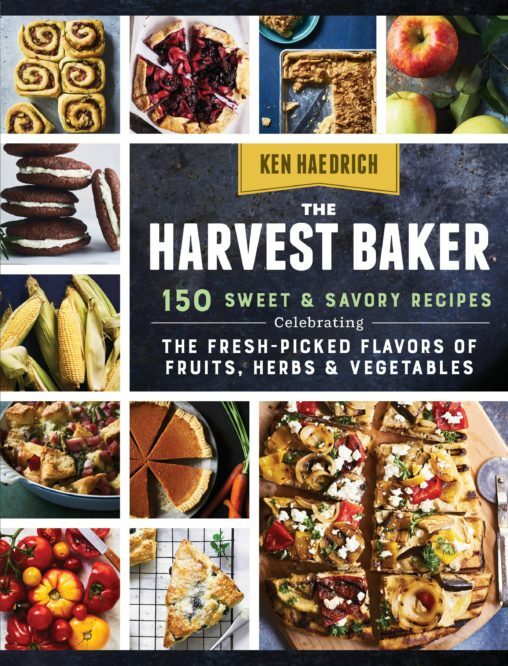 Over the years, I’ve gotten a lot of questions about apple pie from readers and students in my baking classes – not unexpectedly, mind you; I have written an entire book on the subject which, conveniently, you can purchase right here by clicking on the Store tab above. 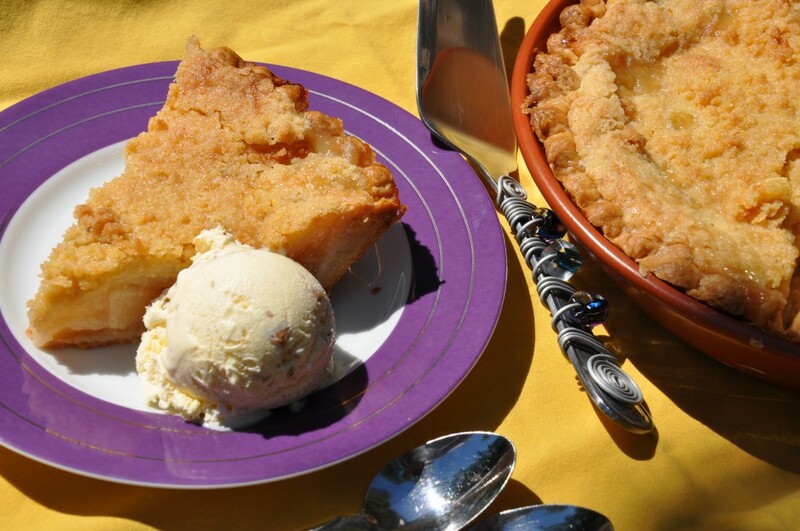 And based on these questions, I get the idea that while we all love apple pie, a lot of us get a little bored, from time to time, with regular ole’ apple pie. We’re looking for ways to spice it up and trick it out. 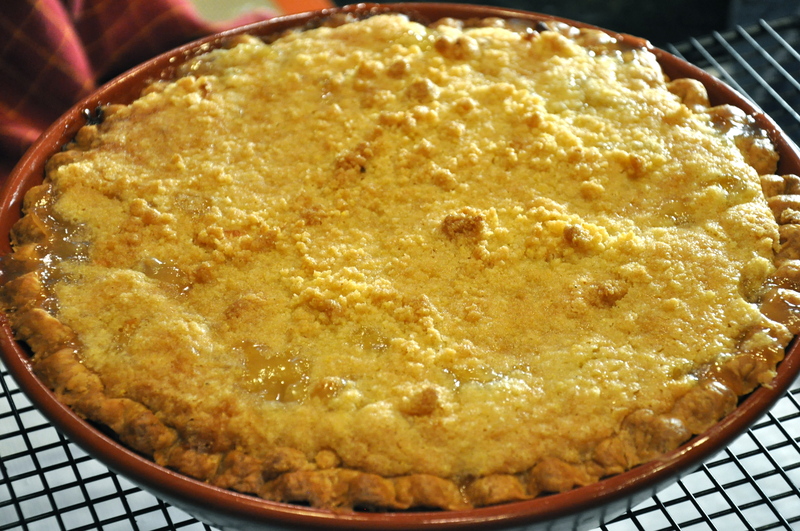 And this great pie does just that in a couple of surprising ways. The first is by adding sliced pears to the mix. They’re a nice change of pace, and the contrasting flavor makes you appreciate the apples even more, I think. The second surprise is the cornmeal streusel. Streusel is, essentially, just crumb topping with a foreign accent, but this one’s quite unique…and I came about it a long time ago by happy accident. Way back when, I was making a pie for a party…I was in a rush and a little distracted – probably on account of the fact that I had four little kids hanging off various appendages, a woodstove that needed stoking, and three feet of snow on the roof that had started to melt, making rather alarming water park-type sounds in my distant bedroom – and apparently I shorted the flour in my topping recipe by no small amount, something I realized only after the pie went into the oven. 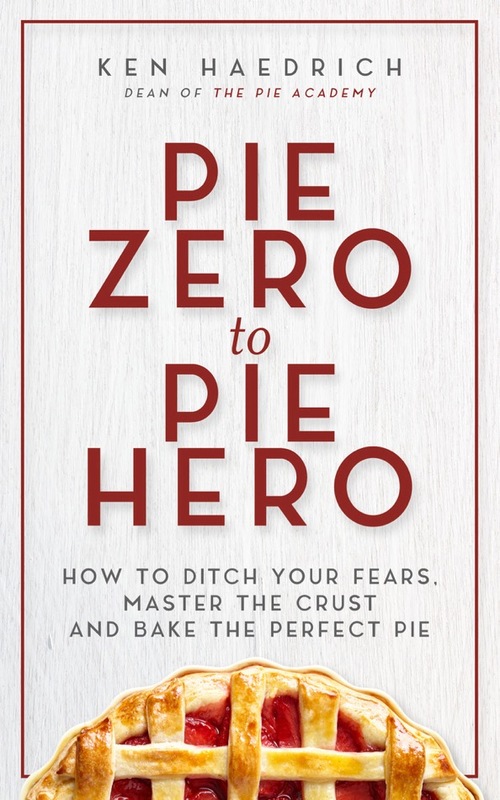 For a moment there – watching the streusel essentially melt apart in the oven – I thought I would face certain shame and bring disgrace to my family and might have to throw myself on my pastry blender, in a final act of pie making hari kari. But then, slowly, something very cool happened: once the crumbs had spread, they started to set up and turn into this very lovely crispy golden blanket. It wasn’t crumbs. But it sure as heck looked great. Tasted great, too, as it turns out and I – and everyone I’ve ever served this pie to – am eternally grateful for this tasty mishap. The reason for these precautions? Just to keep the topping as crispy/crusty as possible, that’s all. Any covering at all will trap moisture and start to soften the crusty topping, so try to avoid it. That’s butter-pecan ice cream you see in the top shot, by the way – my number one choice for this pie. Have a great weekend! PASTRY NOTE: Use any pastry you like for the pie shell, but my first choice is the GOOD BASIC PIE DOUGH. Once the dough has chilled, place it on a sheet of lightly floured wax paper and roll it into a 13" circle. Invert the paper and pastry over a 9½" deep-dish pie pan, center, and peel off the paper. Gently tuck the pastry into the pan, without stretching it, then sculpt the overhang into an upstanding rim. Flute if desired. Place in the freezer for 15 minutes while you preheat the oven to 400°. 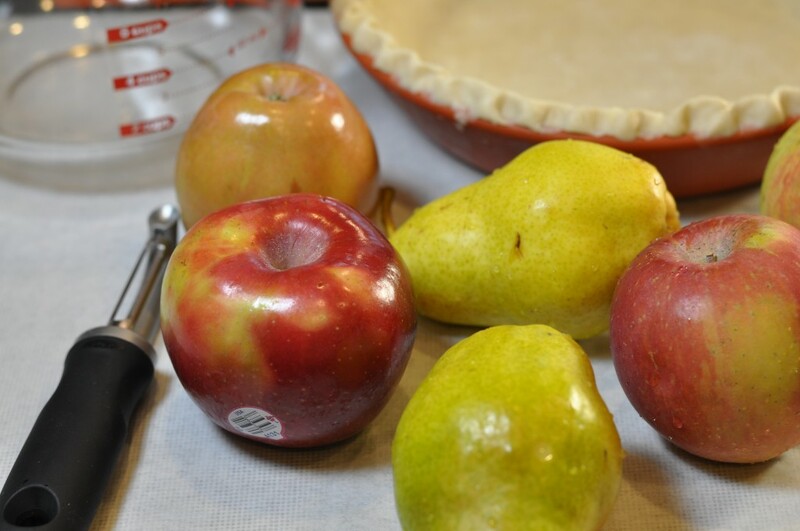 Make the filling: mix the apples, pears, lemon juice, lemon zest, and ⅓ cup sugar in a large bowl. Set aside for 10 minutes, to juice. Mix the remaining tablespoon sugar, cornstarch, and ginger in a small bowl. Add to the fruit and mix well. Turn the fruit filling into the chilled shell and spread evenly. Place on the center oven rack and bake for 25 minutes. While the pie bakes, make the streusel: put the flour, cornmeal, sugar, salt, and cinnamon in the bowl of a food processor. Pulse briefly, to mix. Scatter the butter over the dry mixture. Replace the lid and pulse the machine, repeatedly, until the mixture resembles fine crumbs. Empty the crumbs into a large mixing bowl and rub between your fingers to make larger, buttery crumbs. Refrigerate. 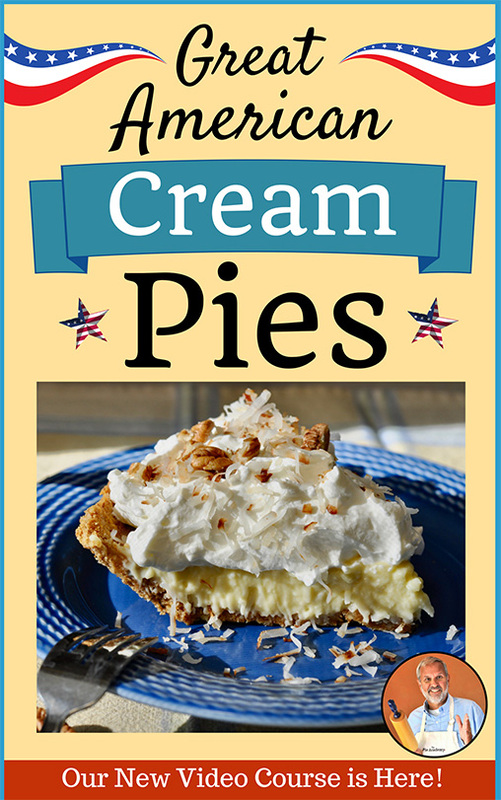 After 25 minutes, slide the pie out of the oven and carefully dump the crumbs over the filling, raking them around with a fork to spread them evenly. Careful not to touch the hot pan. 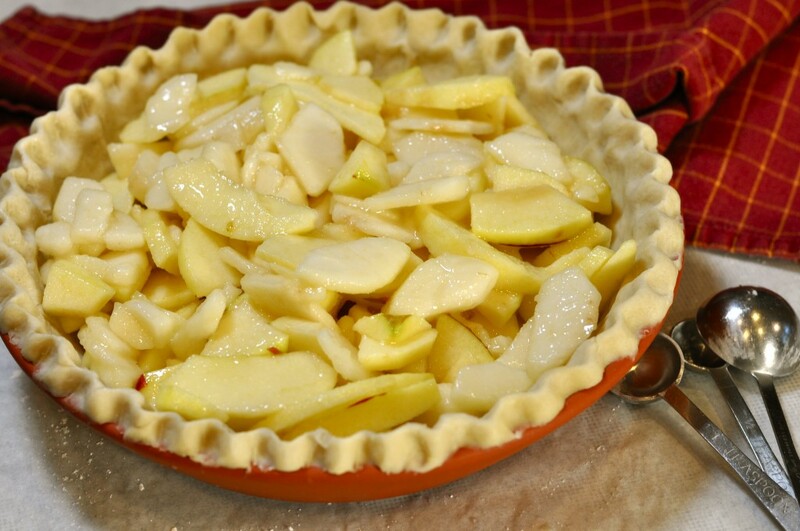 Slide the pie back into the oven and reduce the heat to 375°. Bake the pie another 30 minutes, until the crumbs are golden brown and the fruit juices bubble thickly through the topping. Transfer to a rack and cool thoroughly.